A semi-truck produces 1500 foot-pounds of torque. An Impact wrench can produce over 1800 foot-pounds of torque. An impact wrench takes the torque of a semi truck and gives it to you in the form of a small, handheld tool. 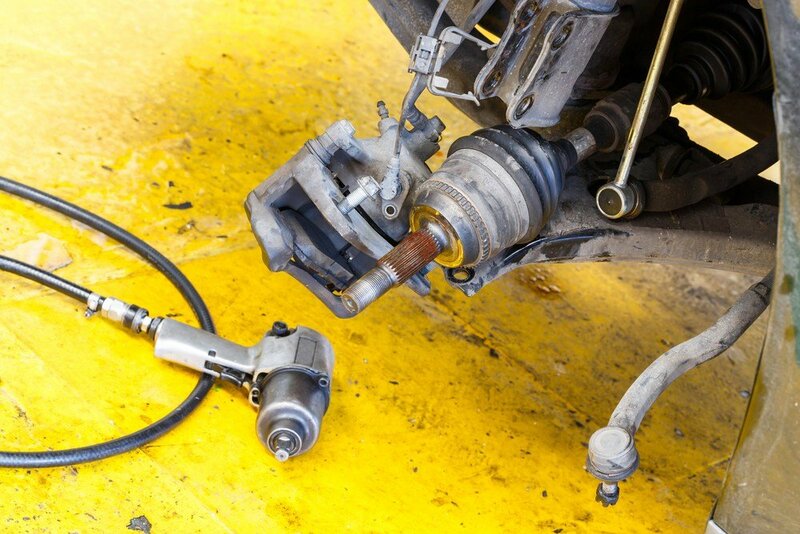 The right impact wrench is essential for removing stuck lugs and crankshaft bolts. The wrong impact wrench is a heavy, maddening, useless tool. Do You Have Enough Torque? I was doing a head gasket replacement for (with?) my brother-in-law on his 1990’s car (I don’t remember the make or model of the vehicle). We hit a massive stalemate on the project when we needed to remove the crankshaft nut to loosen the timing chain (on this model the harmonic balancer required removing). 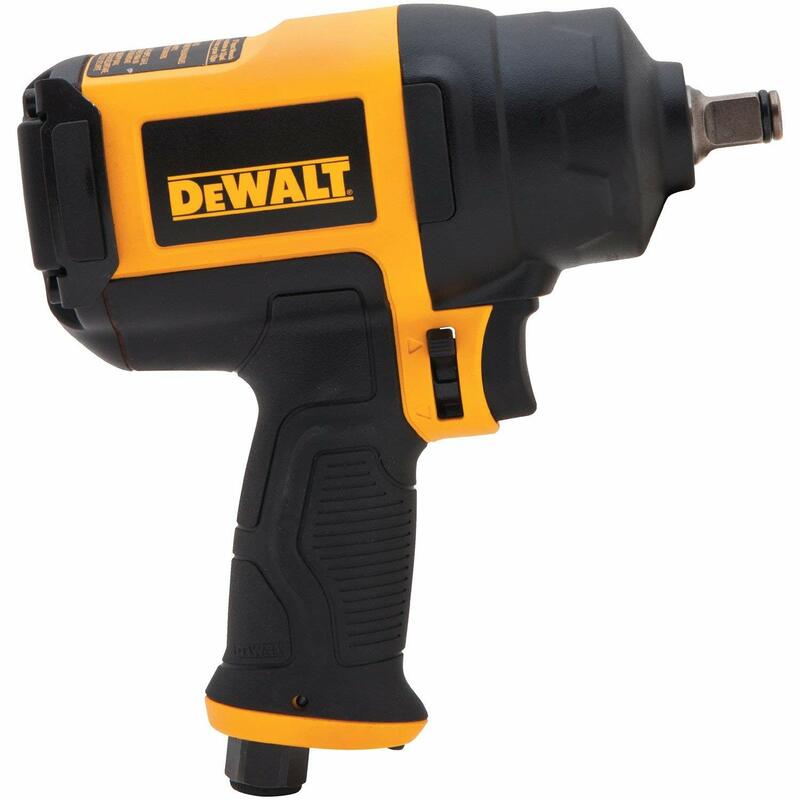 I bought an electric impact “wrench”, but it didn’t stand a chance — no dice. So, I drove the car around the corner to a small mechanic shop. They used their wrench on it for 15 minutes and was unable to loosen the nut, either. Finally, I drove to a shop that sells semi-truck tires. They had a 1-inch impact wrench and were able to release the crankshaft bolt. I then – believe it or not – drove the car home with a mostly loose crankshaft nut. The key, here, is to match the correct wrench to your shop’s needs. As it turns out, you need 1100 foot-pounds to remove a harmonic balancer. However, for lug nuts and most other mechanic tasks, 90 foot-pounds are more than enough. If you are unsure how large of a wrench you need, you can read my buyer’s guide. The Chicago Pneumatic Air Impact Wrench takes the cake with 2145 foot-pounds of torque, making this one of the most potent wrenches on the list. With 500 blows per minute, it has a slightly lower impact rate than the Ingersoll Rand, but the overall torque more than makes up for it. The twin hammer included with the air impact wrench allows for a longer life at the grimiest industrial jobs. Equipped with an efficient six vane motor, the Chicago Wrench provides you with sufficient power to quickly loose the toughest of bolts. You can use any 0.5-inch hose to supply it with the air power it needs. It comes with three power settings and a 3-in-1 flip lever that allows you to regulate between three positions efficiently. Some tools offer a variable speed trigger, but I prefer this setup. With impact wrenches, you are pretty much on or off, so I find three settings to be more than enough. The wrench is a tiny bit lighter than the Ingersoll rand below at only 22 pounds. The side handle makes it easier to handle when maneuvering, and the 6-inch anvil makes it easier to reach hard-to-reach locations. For the oil field, the agricultural operation, and the heavy machinery shop, this tool is a mainstay. It is the tool you need. It is rare that you will ever find a bolt you can’t remove. 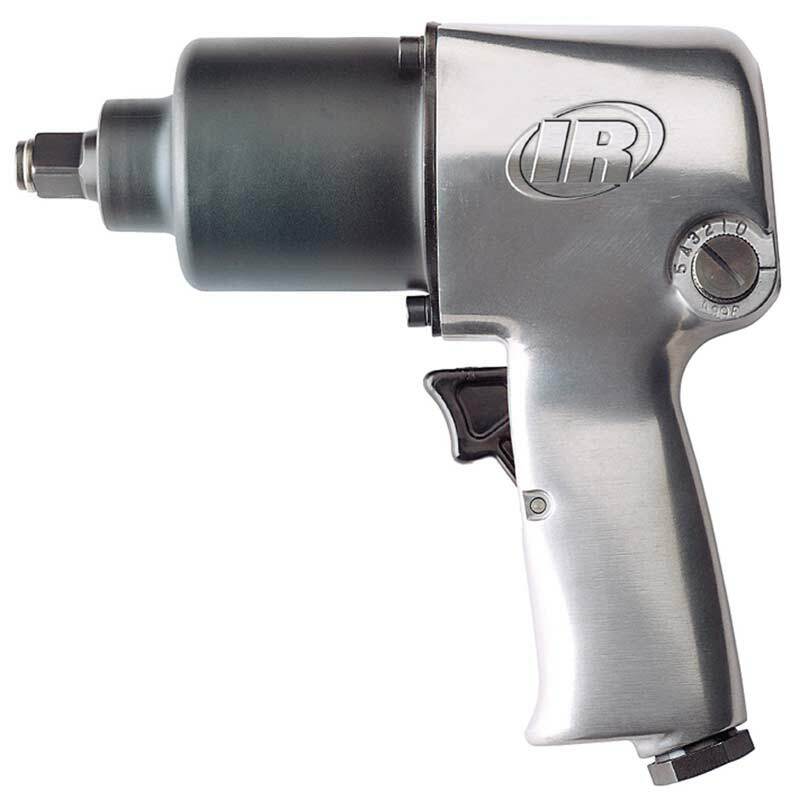 If you’re looking for a heavy-duty air impact wrench, then the Ingersoll Rand 285B-6 will never disappoint. 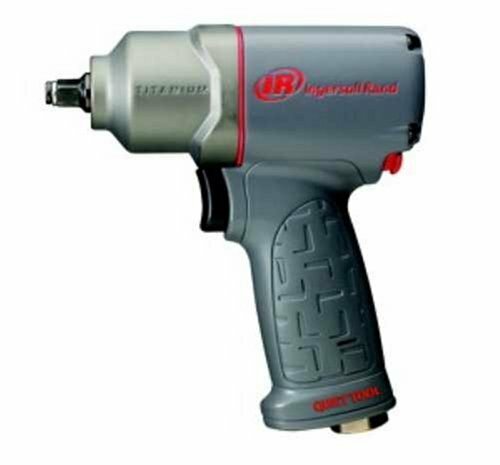 Ingersoll Rand is, in many ways the “Gold Standard” of the industry and is always the first brand I look at when shopping for a new tool. The wrench comes equipped with a high-efficiency motor to help you deliver a maximum 1,475 ft-lb. Torque with 750 hammer blows per minute. This allows you to install or remove even the toughest of threaded fasteners in an instant with high free speeds of 5,250 RPM. What’s more, is you can easily control the torque with a feather touch trigger. This gives you a surprising amount of torque control, considering the rest of the tool’s clunky features. You’ll find that this wrench is all about control. The dual handles and highly efficient motor ensure pinpoint accuracy when installing screws. The handles include a swept back handle which makes it easier for you to maneuver the device and a top mounted dead handle for additional control. The 285B-6 features rugged metal and plastic construction to help it endure the toughest of jobs with ease. The 260-degree swiveling inlet helps to prevent hose kinks, making it easier for you to work with the wrench. 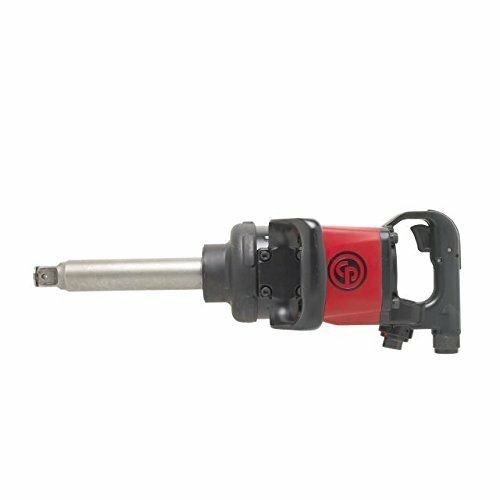 Backed by a one-year warranty and the Ingersoll Rand brand name, this tool is an attractive investment where excessive torque is regularly needed. This tool offers a lot of power but is a fairly heavy, unwieldy device. It is ideal for the shop that needs to remove easy-to-access, yet hard-to-remove bolts. The Ingersoll Rand 2235TiMax is the updated version of the IngersollRand 2135TiMax. If you are looking for an all-around tool that can be the cornerstone of your shop, this is the impact wrench you’ve been looking for. The wrench delivers up to 1,220 ft-lbs of torque which we found more than sufficient for the most challenging assembly (and dis-assembly) jobs. The twin hammer mechanism can help you power through the toughest bolts with relative ease and delivers 1200 blows per minute for intense, rapid work. Also included is a four-position regulator that helps you switch between four power modes seamlessly, giving you multiple torque options. Another nice benefit is that you can quickly reverse the direction with the press of a single button. At only 4 pounds, ergonomically designed handle and smooth operation, this wrench is perfect for those who need to be able to use it for hours without fatigue. The titanium case, as well as the durable composite housing, are sure to make this product a winner for the fast-paced shop. At 91 decibels, it is quieter than most of the competition, and the optional sound reduction tool reduces the sound fatigue even further. This tool offers more power with faster hammers than most of the devices we review, even some of the larger, 3/4-inch drive drills. If you want one tool that can do it all, while being comfortable and “quiet,” this is the heavy duty air impact wrench you’ve been looking for. There are a couple tools that are more powerful, and a few that are cheaper. But this is the best all-around, in my opinion. If none of the above products seem to satisfy your power-hungry operations, then perhaps the AirCat 1600-TH-A will suit you better. Combined with about 1600 ft-lbs of loosening torque, the AirCat can help you perform the toughest of tasks in a matter of two seconds. To help deliver maximum comfort, the 1600 TH-A comes with an ergonomically designed composite housing with finger molds to help you get a more comfortable grip. We also found that the Aircat wrench was as ergonomic as it was durable. Speaking of durability, the power tool hammers are made out of Ni-Cr-Mo alloy steel that provides strength and sturdiness. What’s more, the AirCat comes with a patented silencing technology that helps reduce noise levels to a minimum of 86dB. This ensures you can work from the comfort of your own home without disturbing your family. We love the accessibility the tool provides with its trigger. To top it all off, the tool comes with a 2-year warranty to help you make the most out of your investment. The only little flaw we could find was the heaviness of this air tool. Coming in at 8 pounds, this tool is twice as massive as the Ingersoll Rand 2235 TiMax. But, those 1600 foot-pounds are something the most stubborn bolts will refuse to argue with. For the small shop that is only going to buy one tool, but wants to make sure they are never out-gunned, this is a great one to go with. Much like its predecessor, the Chicago Pneumatic packs a punch with about 1200 ft-lbs of torque! We found the tool to be quite reliable and sturdy as it offers a powerful performance all in a compact package. The twin hammer clutch ensures long life even at the toughest of jobs. The highly efficient six vane motor helps provide you with 6300 RPM. Another point worth mentioning is the lower air consumption at 7.5 CFM. We found that you can easily power the wrench with any compressor using a 0.5-inch hose. And that’s not all! The ergonomic handle makes it easier to hold the tool for long periods without facing any fatigue. The exhaust is located at the handle to help keep exhaust air far away from the operator. Of course, the 1200 ft-lbs of torque is quite high, yet it isn’t our highest one! Also, the device is heavier than most at almost 12 lbs However, the ergonomic comfort handle makes it easier to hold the device despite the heavyweight. A Strong Contender For Zach’s Top Pick! The much aptly names, Aircat Killer torque impact wrench never fails to deliver killer power for all your nuts and bolts. The impact wrench comes with nut busting variable speeds to help deliver about 1,295 ft-lbs of maximum torque for loosening tough bolts. We found the wrench to be quite powerful and fast as it can deliver a hard-hitting 1400 blows per minute. What’s more, the twin hammer clutch ensures that the wrench can bear the toughest of applications. The notable point is that the rotor of on the wrench is 15 percent larger than most. This grants you unmatchable power in all kinds of applications. 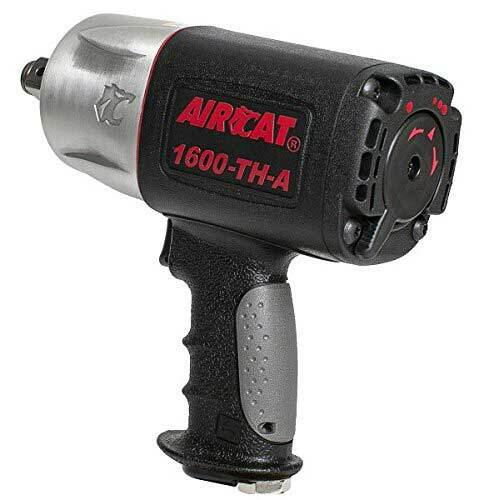 Much like the 1600-TH-A, The Aircat 1150 also comes with a patented quiet technology that significantly reduces the noise level to about 86dB. This makes it easier to use in DIY as well as industrial applications. To add to the ergonomics, the device is quite lightweight, weighing about 4–5 lbs The 2-year warranty is just the icing on the whole cake. One of the advantages of this wrench kit is that you can easily buy different configurations that include extensions, and a 3/8 inch air ratchet combo. For the shade tree mechanic and small shop, this is going to be an excellent tool, at a fraction of the cost of the Ingersoll Rand. Our vote stays with the more robust Ingersoll Rand, but this is an excellent option. Overall, the Air Cat Killer Torque Impact Wrench delivers raw torque to aid you in the toughest applications (including harmonic balancer removal). It might be a tad heavier than the rest, but you won’t likely find a nut it can’t handle. The DeWalt Square Drive Impact Wrench is the top pick for the shade tree mechanic who wants to get a wrench that does not have major air requirements. With a 1/4 inch air intake, and a small requirement of 6 CFM, this impact gun will plug into almost any compressor. Offering a maximum torque of about 650 ft-lbs and 1100 blows per minute, this gun is going to handle pretty much every task you’ll run across (including most harmonic balancers). The heavy-duty motor provides an RPM of about 7500 at a pressure of 90 PSI. Moreover, the twin hammer mechanism not only helps provide higher power fastening but also helps provide durability and ruggedness. This means you can easily use it for years on end without worrying about failure. The adjustable power regulator allows you to vary the torque easily and thus makes it easy to operate. Another remarkable feature is the one hand operation which comes with a single forward/reverse switch. This makes it easier to quickly and easily directional changes. The shock-resistant body makes it easier to operate without being bothered by excessive vibrations (although the rubber tends to pick up more dirt). A major drawback is that perhaps the reverse/forward switch can be too easily pressed which means you can end up changing directions accidentally. Easily the quietest wrench in the shop. This is one of the top-selling impact wrenches of all time. Made to be ruggedly durable for an affordable price, this is the wrench that you let your stupid nephew borrow. The Ingersoll Rand 231C Super Duty features a twin hammer mechanism that delivers a maximum torque of about 600 ft-lbs, with top speeds of which provides up to 8000 RPM. It’s the perfect amount of power for swapping lugs and doing small jobs around the shop. The Super Duty wrench is not too heavy either. It clocks in at a moderate 5.8 lbs Moreover, it is quite compact, which makes it easier to fit in your hands. The contoured handle further ensures that your fingers conform perfectly to the handle and result in minimum fatigue with good ergonomics. The adjustable power regulator to allow you to change the torque accordingly, but isn’t super easy to adjust. Most folks leave it set at one torque and only adjust it for those weird tasks that require more power. Some folks seem to have an issue where the trigger tends to get stuck after a while. Just needs a little cleaning and then it will be as good as new. The Ingersoll Rand 231C Super Duty Power Wrench is best for DIY users and those working in the automotive industry. Due to the low torque, we would not recommend it for very heavy-duty applications. Big things come in small packages! 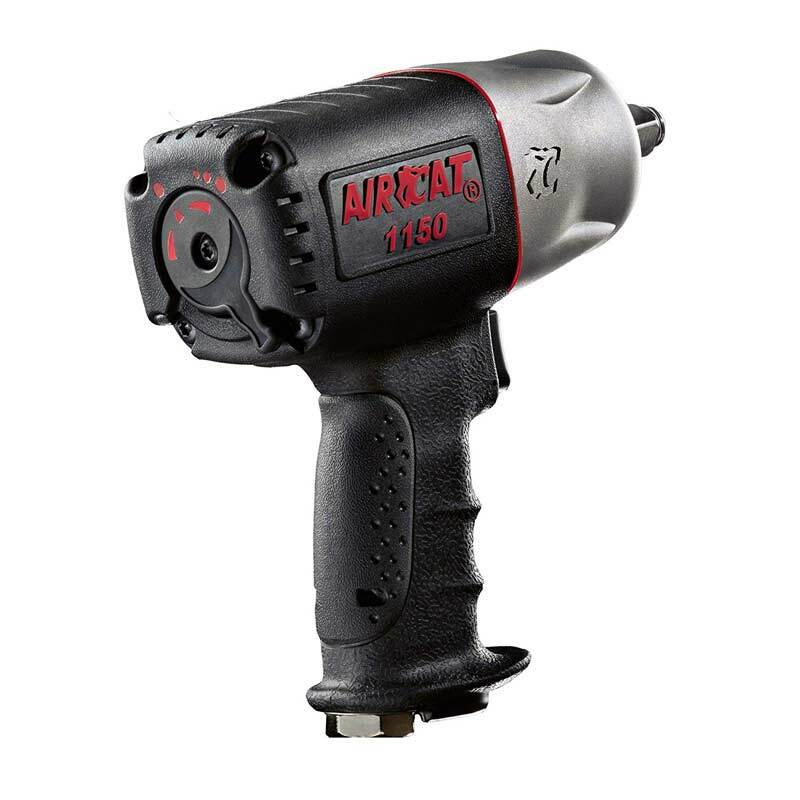 The Ingersoll Rand 115TiMAX Impactool is the definitive proof with its high torque and extremely lightweight body. The tool measures less than 6 inches in length and weighs a shocking 2.5 lb. This makes it the lightest air wrench in our roundup. The unique seven vane motor helps deliver maximum power and torque to the tool. The tool can deliver about 300 ft-lbs of torque which might be lesser than the others on the list. However, this one has perhaps the highest power to weight ratio. The feather touch trigger makes it easier to change the settings or rotation direction within seconds. The device uses less air as it optimizes air flow. Also included for optimum control is the one hand forward or reverse regulator which makes it easier to control and maneuver (top of the trigger is one direction and bottom is the opposite). The small size of the tool makes it easier to access the smaller spaces and nooks. Where the product might fall short for some folks is the noise. The operation can get a little loud at times, a problem that can be easily solved by adding a muffler. Best Heavy-Duty Impact Wrench: With 2,145 Foot-Pounds of torque and only 22 pounds of weight, this is one of the lightest impact wrenches in the the Heavyweight category. Best Versatile Impact Wrench: At only 4 pounds, but with 1,220 foot-pounds of torque, this is an incredible tool that is perfect for removing lug nuts, but also handy for those one-off scenarios where you need a little more oomph. 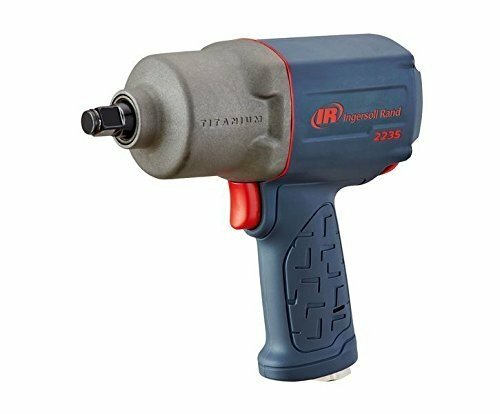 Best Cheap Impact Wrench: Just got hired and need an impact wrench to get you until payday? The Ingersoll Rand 231C has put more bread and butter on the working man’s table than about any other tool. This is the one that you’ll unwittingly hand down to your Grandkids. To be precise, an air impact wrench is a powerful tool that delivers a high torque by using compressed air. It is used to fasten or loosen tight bolts and nuts. The main purpose of using a wrench is to minimize the user exertion or effort. They are used in many applications including maintenance, automotive as well as in various DIY projects. How Does the Hammering Mechanism Work? 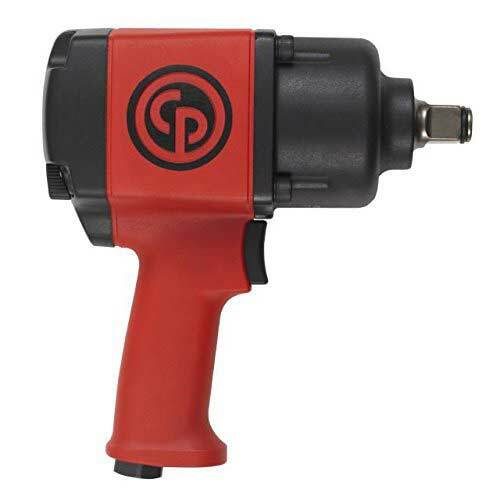 When working with Air Impact Wrenches, a term you might often hear is a ‘hammer.’ An impact wrench works when an air compressor provides power to a motor. The motor further transfers the energy to a rotating mass called a hammer. This hammer carries a lot of momentum with which it hits a part called the anvil. This tends to create an impacting torque which is delivered to the recalcitrant nut.automotive as well as in various DIY projects. The hammering mechanism ensures that the hammer suddenly impacts the anvil which results in the high impact torque. 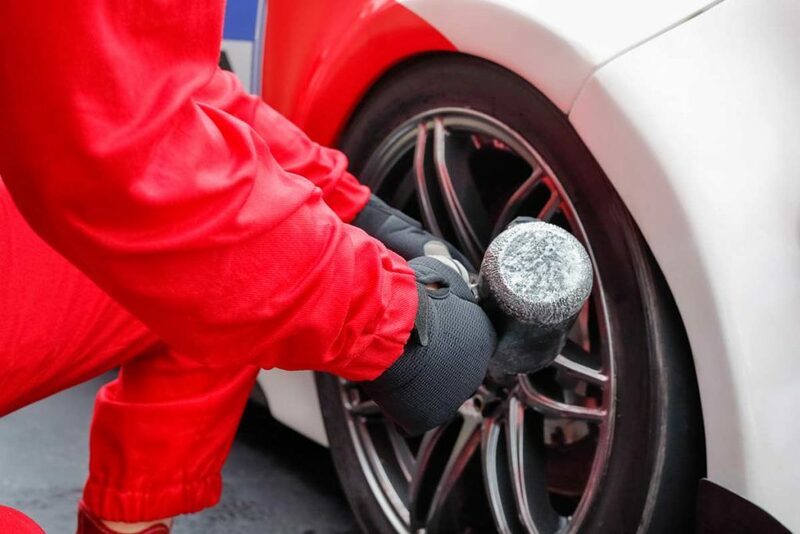 You’ll note that the only force you can feel is the motor when it accelerates the hammer, so you feel little to no torque. It’s not the size you should worry about rather the PSI and CFM on the compressor should be your main focus. Each wrench has different requirements. Check with the manufacturers about what CFM and what pressure does the tool require to operate. I also wrote an air compressor sizing guide that has general airflow requirements. What Is the Difference Between a Pneumatic Wrench and a Cordless One? While checking out your options, you might come across cordless impact drivers. Cordless versions use a battery to operate the wrench while the pneumatic wrench uses compressed air. The pneumatically-powered wrenches generally deliver much more torque power than the battery-operated ones. They are ideal for shop conditions where an air compressor with sufficient CFM is available. These tools are hardy, reliable, and ideal for heavy mechanical use. However, they need a large tank and pipe hose connection to run them. If you do not own one already, this can result in added costs. Plus, they are heavy and limited to using near an air compressor. These are rare and designed for the shade tree mechanic who can’t afford an air compressor. They tend to be bulky, heavy, and only produce around 300 to 500 foot-pounds of torque. These fascinating tools deliver up to 1,200-foot-pounds of breakaway torque, putting them on par with their pneumatic brethren. The downside with the Cordless Impact Wrench is that they need frequent battery charges. These are ideal for tow trucks, mobile mechanics, steel working, and agricultural uses. The key here is the word “drivers”. Cordless drivers are replacing the hammer drills on job sites and deliver less torque, typically measured in “inch-pounds”. The cordless impact driver is an essential part of every construction worker’s tool belt, and I’ve seen some mechanics use them on vehicle repairs. Torque is pictured as a one-foot-long wrench attached to a bolt. If you were to hang a weight on that, you would be applying 1 foot-pound of turning pressure to that bolt. Now, you could increase that pressure by either making your wrench longer, or by adding more weight. A 2-foot-long wrench with a 1-pound weight would be 2 foot-pounds of turning pressure, or “torque”. Power is often used interchangeably, but it has more to do with the “horsepower” of a motor and how quickly work can be accomplished. We don’t discuss that much in our reviews, but a bigger motor with the same torque could make shorter work of a task. Practically speaking, torque is typically the limiting factor around the shop. And more torque isn’t better. If you are using a wrench with 1100 foot pounds of torque to change your car tires, then you will likely want to use the regulator switch to regulate that down the lowest setting so you don’t twist a lug nut off. Hence, the reason I highlight the adjustable setting to help you control the torque more easily. Next, I recommend you go for a twin hammer mechanism. In this mechanism, two hammers hit the anvil from both sides at the same time. This delivers a larger impact torque output. The main benefit is the longevity of the tool as it will deliver more torque in less time and with less air power. The most common drive sizes tend to be 1/2 inch. However, there are some available in the 3/8 or ¾ size as well. Choose one that fits your needs better. Bigger anvil diameters give you more leverage if you work with a lot of large diameter nuts. Since you might be using the tool for a long time, you need to ensure that the device is lightweight. Generally, a composite (or partially composite) construction or high tech alloys or titanium tend to be lighter. This will ensure that you can work continuously with minimum fatigue. These tools tend to be quite noisy which can be harmful when exposed to for long periods. The quietest ones are still 86 decibels. Most tools come with a quieter technology or a muffler to ensure quieter operation. But even then you should wear ear protection. If you’re investing hundreds of dollars into a tool, you need to ensure that it will last you a long time. Usually, tools with durable materials tend to last longer. If nothing else, at least make sure the product has a long warranty. A one-year limited warranty is common on these. Since most pneumatic wrenches are durable, they do not require too much maintenance. Oiling the tool every 20 days or so is often more than enough to keep them running well. 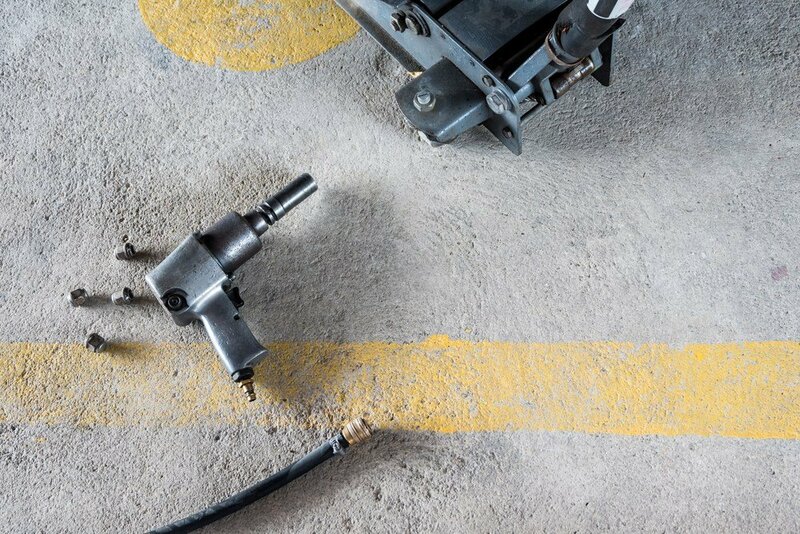 Many shops oil their pneumatic tools daily, and the more frequent oiling should only help to extend their life.